The Cooper River is a meandering tributary of the Delaware River in Camden County with a rich cultural heritage. Along the Cooper River, English Quakers found safe haven from religious persecution in Colonial times, and General Washington's soldiers fought for control of Cooper's Ferry during the American Revolution. The river was ideal for industry in Camden, where many immigrants worked in the factories along its banks. From 1925 to 1928, landscape architect Charles Leavitt Jr. designed the plans for the 550-acre Cooper River Park. From 1935 to 1939, Roosevelt's Works Progress Administration carried out the plans to create open, gently sloping landscapes and wooded areas for recreation by dredging meadows and tidal wetlands. 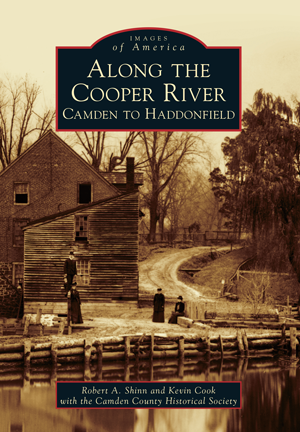 Along the Cooper River: Camden to Haddonfield focuses on the communities of Camden, Pennsauken, Cherry Hill, Collingswood, Haddon Township, and Haddonfield and how each of them has played a unique role in the long and rich history of the river and its evolution into a nationally significant recreational area. Historic preservation advocates Robert A. Shinn, a Camden County Historical Society board member, and Kevin Cook compiled this book with images from local historical societies and other collections to chronicle the river's heritage.